Enrique Gil (upper right) has been chosen to replace Albie Casiño in the upcoming Star Cinema movie starring Kathryn Bernardo (lower right) and Julia Montes (lower left). Sam Concepcion (upper left) will still be part of this upcoming movie to be directed by Jerry Sineneng. The upcoming movie of Kathryn Bernardo and Julia Montes undergoes another major change. Last March, it was reported that AJ Perez and Albie Casiño were supposed to be the leading men in this movie. However, the untimely death of AJ last April 17 prompted Star Cinema to choose young actor Sam Concepcion to take his place. However, another major change has been done regarding the casting of the movie: Albie has been replaced by Good Vibes star Enrique Gil. 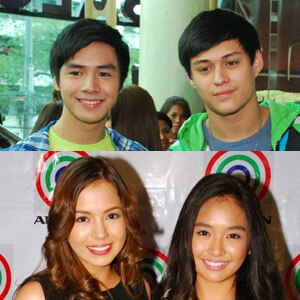 The latter is also seen in ABS-CBN’s remake of Mula sa Puso. According to Star Cinema, the change in the lineup is prompted by their desire to experiment with different combinations for Kathryn and Julia. To date, Enrique has done three shooting days and he took part in the pictorial of the still untitled movie. In a previous interview, Kathryn Bernardo mentioned that she and Julia will portray sisters in this movie to be directed by Jerry Sineneng.